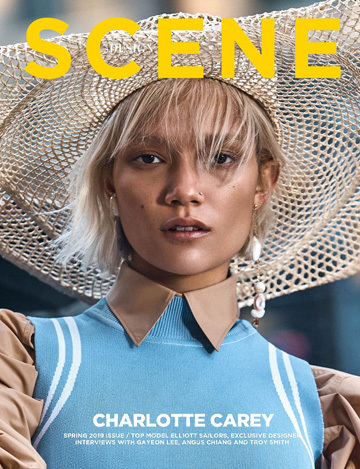 Discover our latest Beauty SCENE by DESIGN SCENE Magazine‘s Spring 2019 cover story featuring the striking Cate Underwood at The Lions lensed by fashion photographer Andrew Stinson at See Management. In charge of styling was Jess Monterde at Bernstein & Andriulli, with production from Sheri Chiu. Beauty is work of hair stylist Clara Leonard at Atelier Management, and makeup artist Deanna Melluso at See Management. For (Un)Covered story Ukrainian stunner is wearing selected pieces from Christian Dior, Castlecliff, Repeller, Wkndla, Everlane, M Missoni, Orseund Iris, The Frankie Shop, Eres, Anh Jewelry, Tibi, and The Great Eros. Photo assistance by Robert Critchlow, and styling assistance by Shoji Sano.